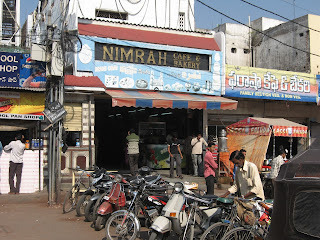 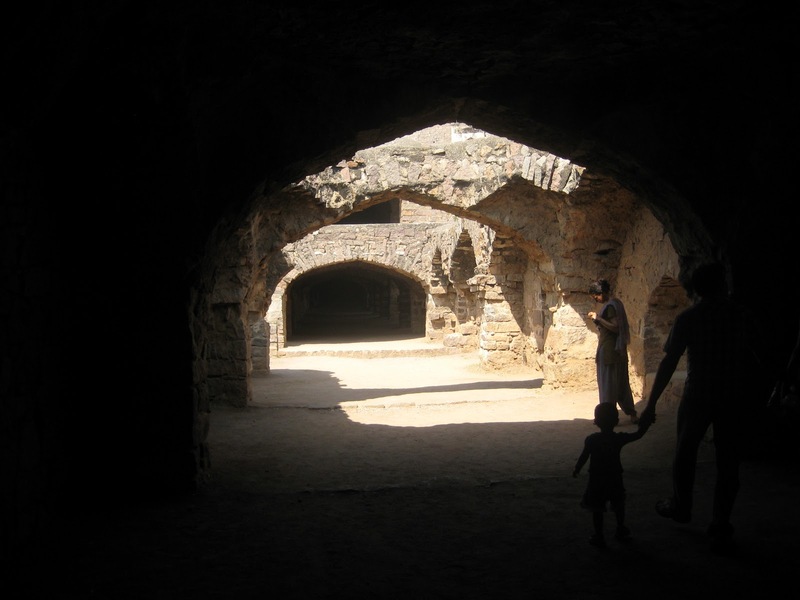 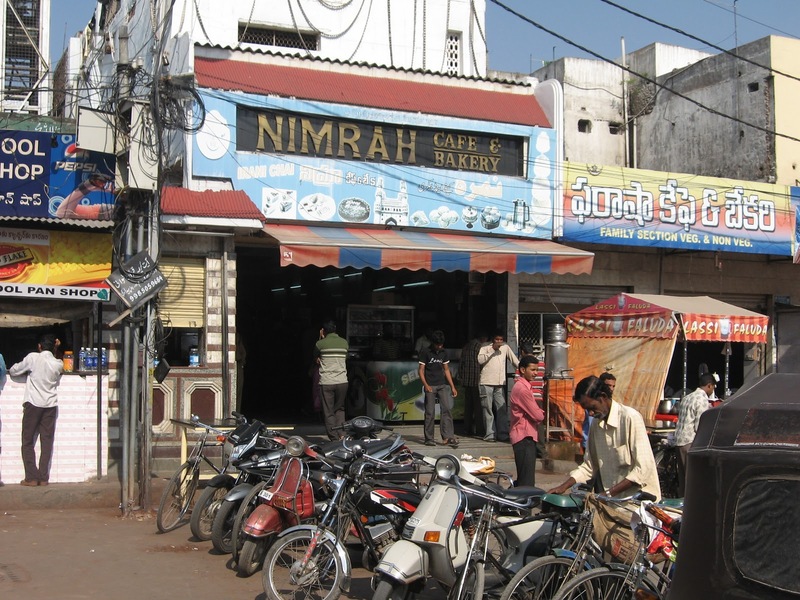 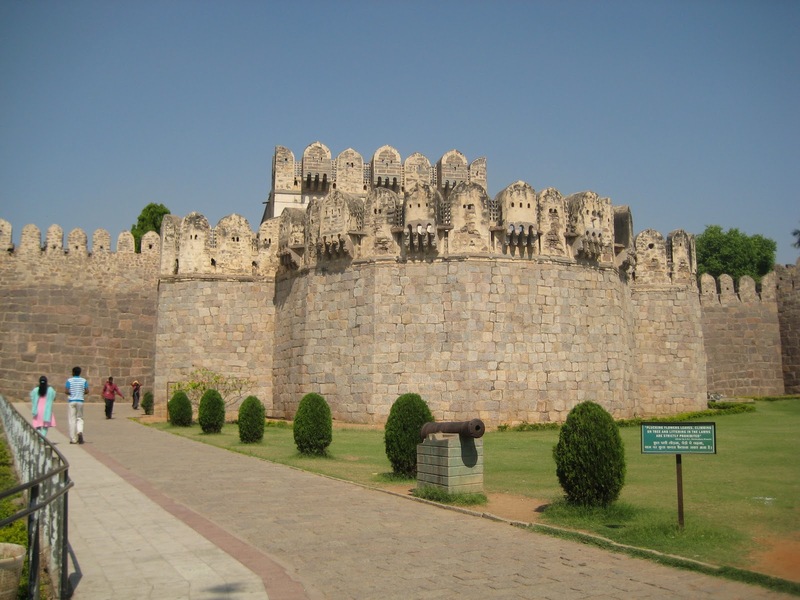 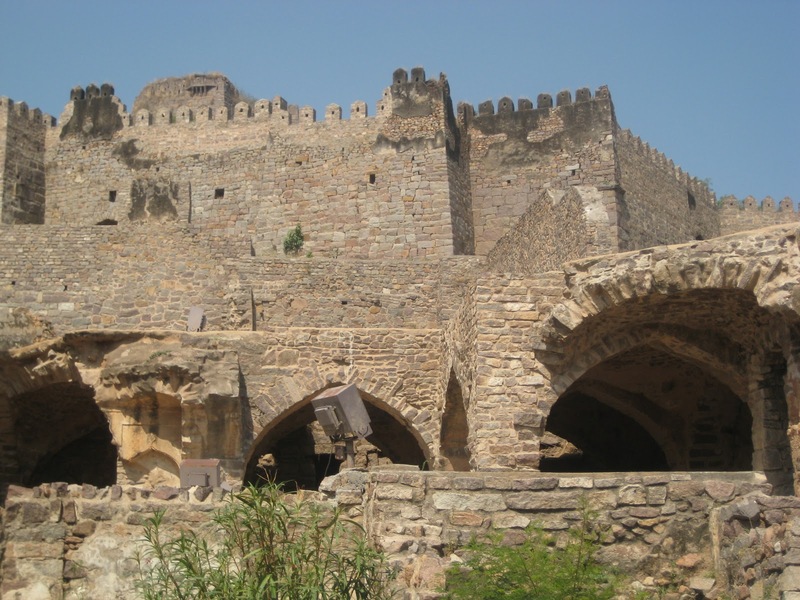 On Sunday morning, after breakfast in the hotel, we headed of to experience what tells us are must-see features of the city: Chaminar and Golconda Fort. 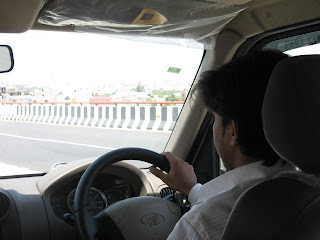 Glad to be shepherded by Amrit and two drivers once again, and conducted in two vehicles he arranged for us, we travelled first to a striking 4-sided archway crowned with minarets, Chaminar. 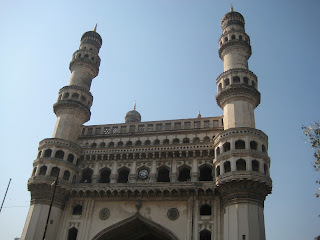 The structure was laid out by Muhammad Quil Qutb Shah in 1591. 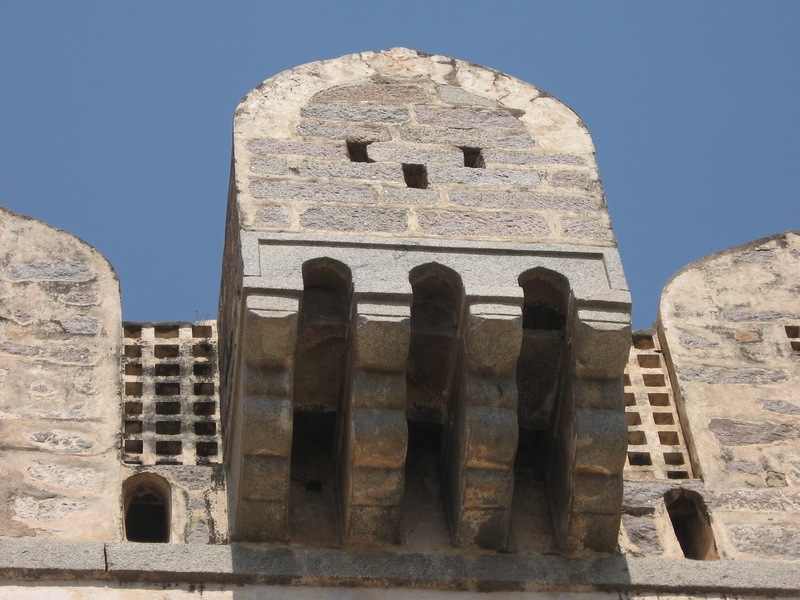 It is said to commemorate the elimination of a plague from the area. 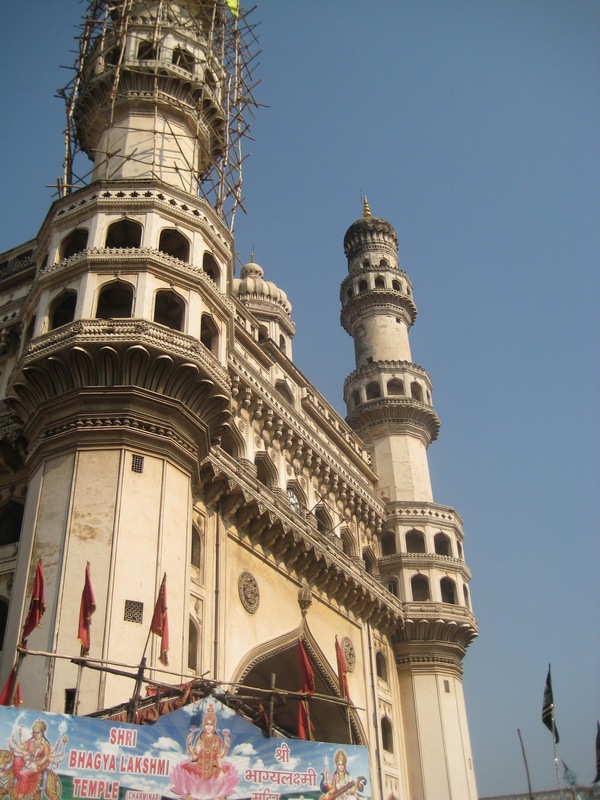 It is also reported that on this spot, before the structure was built, Muhammad Quil Uutb Shah had prayed for the end of the plague, vowing to build a mosque in the place where he prayed. 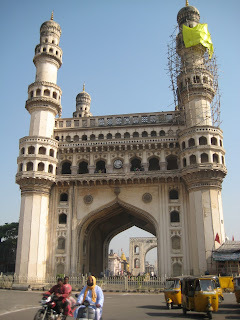 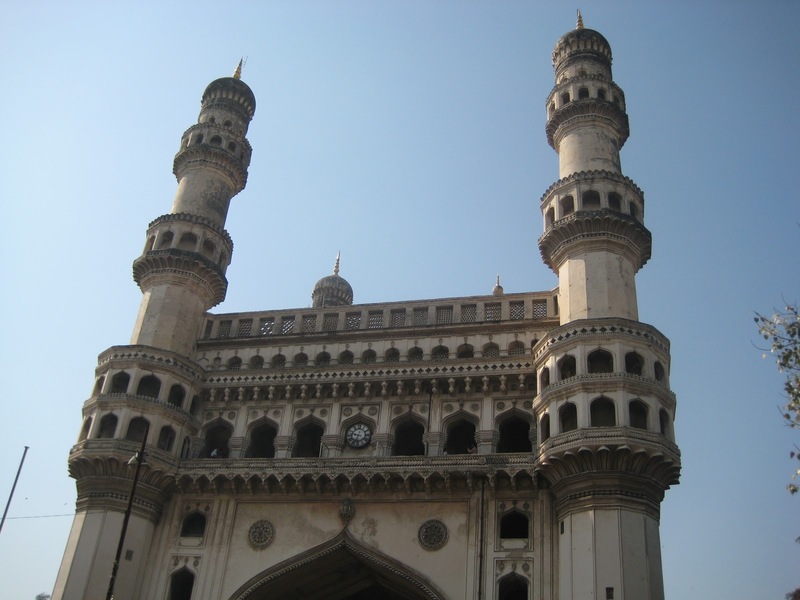 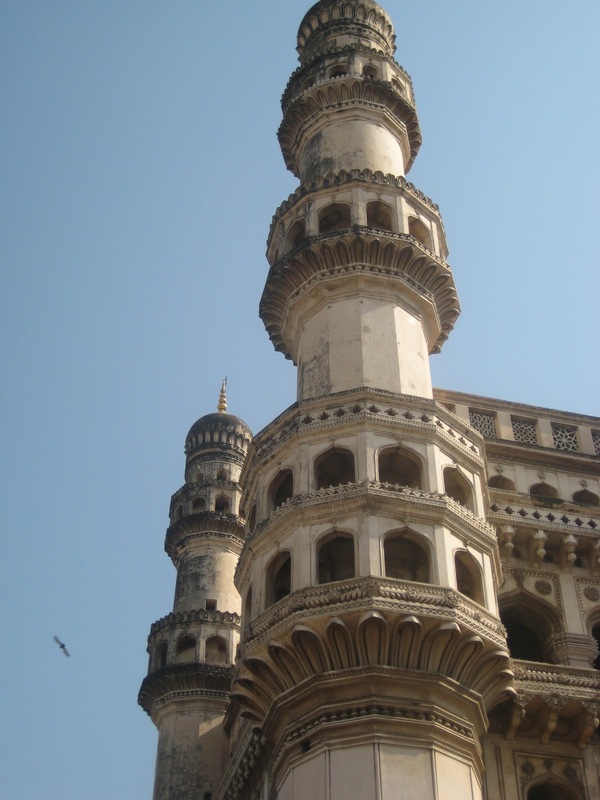 The name - Charminar is said to be made from two words that mean "4 minarets." 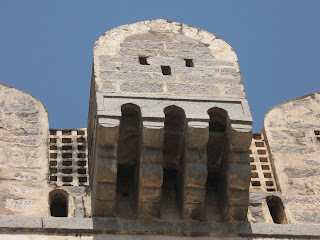 ...is a small Hindu shrine right alongside the face of Chaminar, aptly symbolic of the complex religious fabric of this part of the world where the languages of Hindi, Urdu and English are spoken alongside, or even intermixed, with another tongue native to this area -- Tegulu. 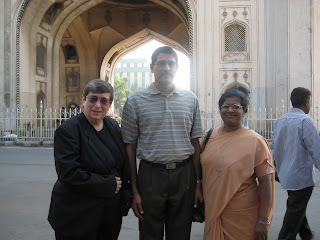 Above, Arun appears to have a moment of enlightenment as he stands with Sister Joan and Sister Alphonsa of St. Francis College. The ancient structure of Charminaris right alongside shops, and vendors of various types. And this was also one location where we were approached by folks, some who appeared to be in dire circumstances, hands outstretched for money. 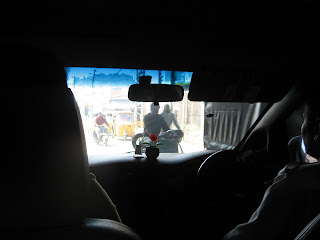 The needs seemed real, and were stretched by the desire to help and the concern that a foreigner handing out money on the street might not, for a variety of reasons, always be a good thing. But we had no problems at all, and I remained amazed by the diversity of people -- in color, dress, activity and language in this area. 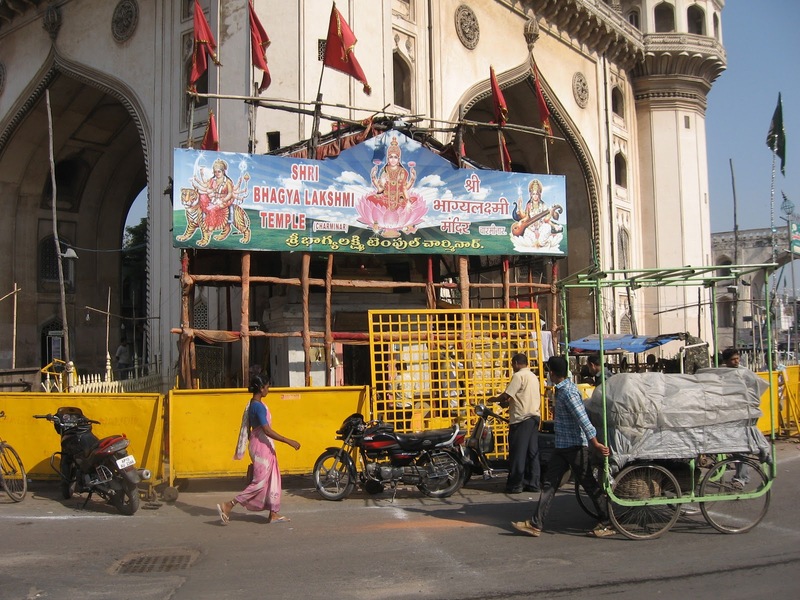 While there was plenty of activity, Amrit pointed out that this was a fairly quiet part of the day, and that the many vendors on the street would grow in the coming hours. 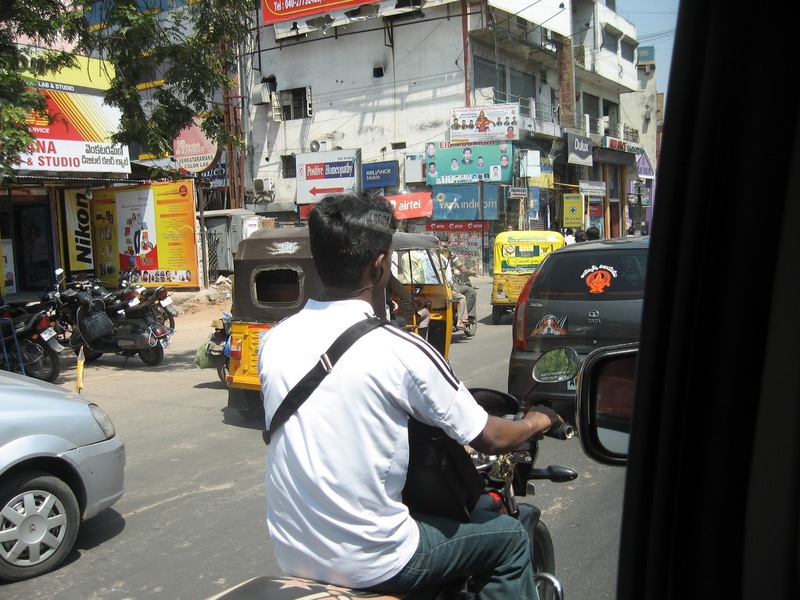 Then Arun headed back to the hotel to do more of his constant work arranging for meetings that are critical to our productive appointments while in India. 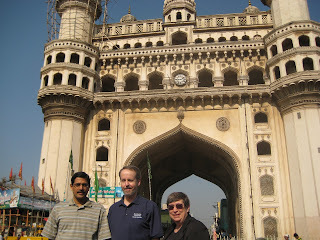 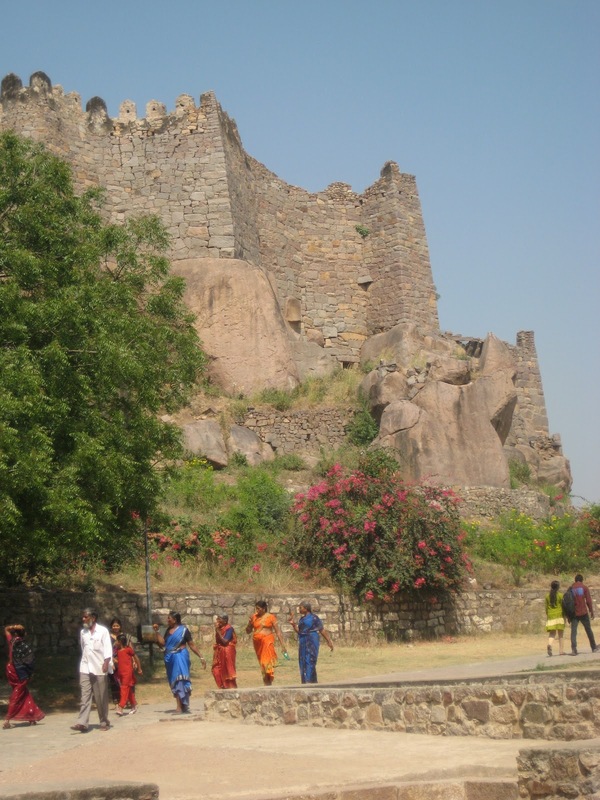 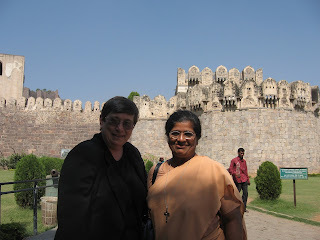 Sister Joan, Sister Alphonsa and Dave headed out to see another amazing sight in Hyderabad -- Golconda Fort. The massive structure stretches up the hill, and is filled with the story of the power required to build this amazing fort. 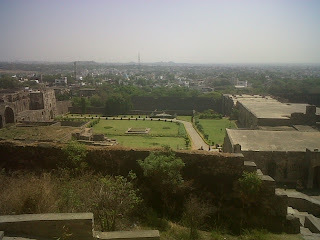 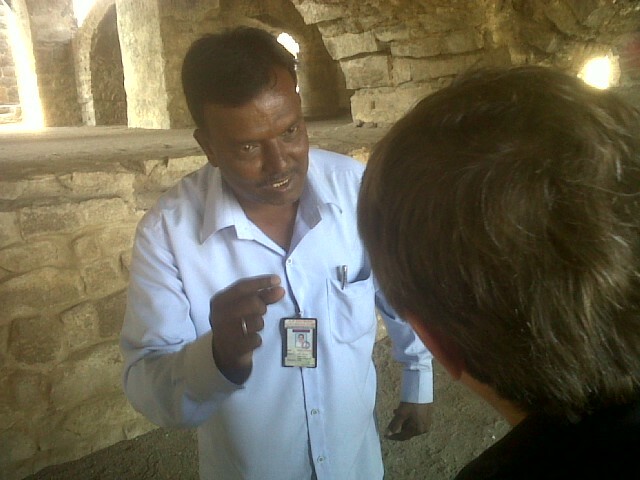 And, to see Golconda fort up close involves stairs, more than 780 of them. 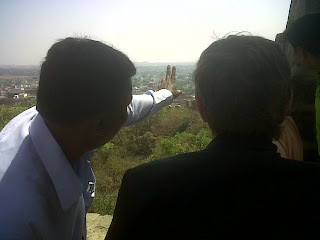 A﻿﻿﻿mrit is a trained architect, so I asked him what features amazed him the most about this place. 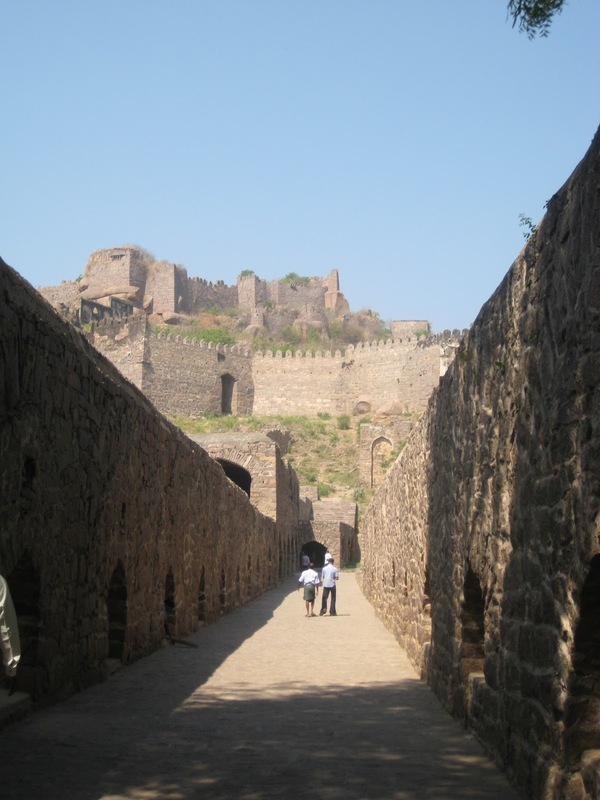 Overall he found it a wonder to see the true, straight walls put together with no mortar. He explained how difficult it is to build such extremely heavy walls that stand the test of time. 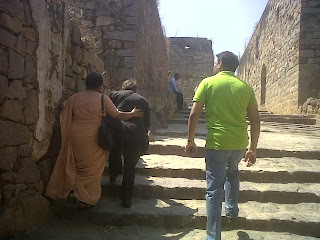 As we climbed the many steps, we paused to overlook the greenery, water retention tanks, and places of worship that make this place a marvel. 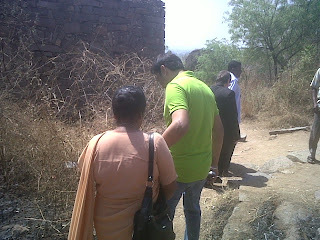 Our descent involved a little off-road journey, where our guide, and Amrit provided assistance on the rocky terrain.